Across North America, efforts to put a price on greenhouse gas emissions are growing, creating a market-based incentive to reduce emissions and energy use. Currently 14 US states and Canadian provinces plus one US city have done so, with seven additional states and provinces in active pursuit, according to ACEEE’s new white paper. We profile these state and provincial efforts and explore lessons learned from them. Their progress is important, because federal steps to address climate change are unlikely even though the recent Fourth National Climate Assessment warns of dire climate impacts. While some carbon pricing efforts cover just the power sector, others also cover transportation, buildings, and industry. Two major approaches are now in use—a carbon tax (sometimes called a fee or levy) and a cap and trade system, both of which can improve energy efficiency. A carbon tax charges a fee for every unit of carbon dioxide that is emitted. While its cost is known, its effect on emissions is less certain. Carbon taxes are now in place in the provinces of Alberta and British Columbia, and the city of Boulder, Colorado. 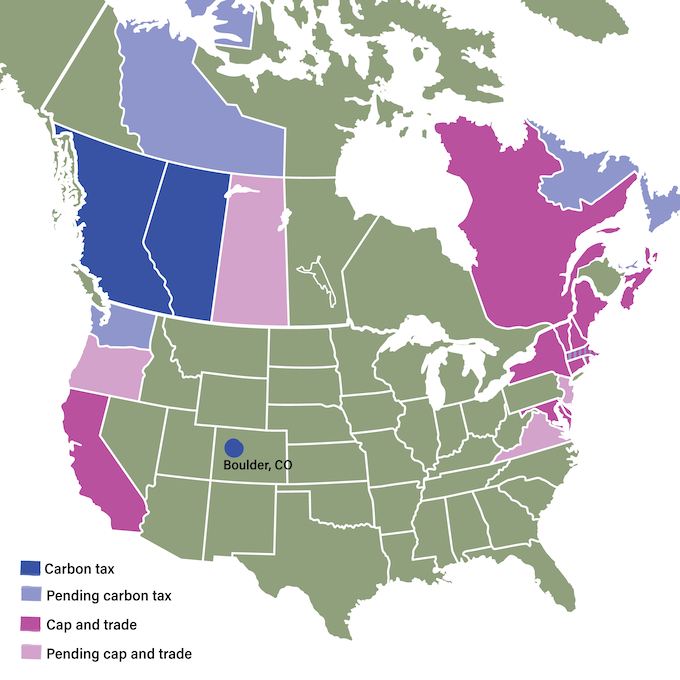 Massachusetts, Washington state, Newfoundland, Prince Edward Island, and the Canadian Northwest Territories are all seriously considering carbon taxes. Most of these cover multiple economic sectors. A cap and trade system puts a cap on greenhouse gas (GHG) emissions and issues emissions permits, often referred to as “allowances” or “certificates.” Emitters can trade these certificates, allowing the market to find the lowest-cost emissions reductions available. With cap and trade, the level of emissions is known. What is less certain is the market price of the certificates. This approach is in place in California, Quebec, Nova Scotia, and nine northeastern states that are part of the Regional Greenhouse Gas Initiative (RGGI). New Jersey, Virginia, Oregon, and Saskatchewan are now seriously considering cap and trade programs. RGGI covers just the power sector; the other programs are broader. Both carbon taxes and cap and trade programs affect energy efficiency in two ways. First, they can raise energy prices, which makes the economics of efficiency more favorable (e.g., if the price of energy is 10% higher, the value of energy savings increases by 10%, all other things being equal). Second, in all of the jurisdictions that we looked at, some of the funds collected are invested in energy efficiency for residents and businesses (or there are plans to begin such investments in the future). Efforts to price GHGs have been in place for about a decade in British Columbia, Alberta, and the RGGI states, and for five years in California. Evaluations of these programs find that they reduce GHG emissions and promote energy efficiency (the report includes details). One key lesson is that a considerable portion of income from these programs should be invested in energy efficiency. The most successful programs for providing emissions reductions, energy savings, and economic benefits, such as RGGI, devote a substantial share of revenues to efficiency programs. Another important lesson is that many of the programs provide rebates or other special considerations for low- and moderate-income households, helping to cushion the impact of carbon pricing on these households and avoid the public backlash against a carbon pricing proposal in France. Based on the programs we profile, we recommend that other states and provinces (and eventually Congress) seriously study and ultimately adopt a price on GHG emissions that builds on the lessons from these leaders. However, we find that a price on emissions, while an important strategy, will likely need to be complemented with other approaches to reduce energy use and emissions (e.g., transportation, buildings, and industrial policies) if the US and Canada are to meet long-term emissions goals. Cassandra Kubes co-authored this blog post.